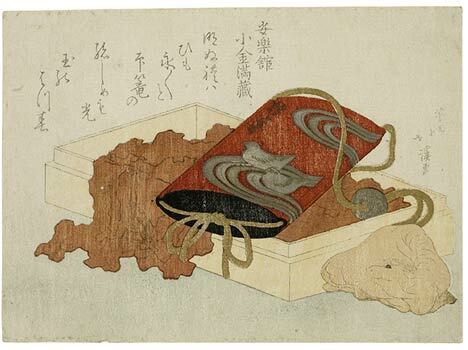 This beautiful engraved and printed surimono with rounded contours on the netsuke ox, silver on the inrō and ojime, and embossing on the cord and for the woodgrain pattern of the box, is also interesting from a historical point-of-view for the evidence it gives of the revival of interest in Karin and the Rimpa style in early 19th century Edo. Kōrin is now considered as one of the great artists of the Edo period, but the esteem in which he was held during his lifetime quickly faded and he was remembered by successive generations of artists mainly as a designer of kimono patterns. This may seem incredible to us, but most of Kōrin’s great paintings were done for private individuals and were simply not available for study or viewing of any kind after they were painted, and so had little immediate influence. In 1797, Hokusai, who had been adopted into the decorative Tawaraya School and had taken the name Sōri, presumably on the model of Kōrin’s great predecessor Tawaraya Sotatsu, seems to have had access to some of Kōrin’s work. In a poetry album published that year he designed a print of a plum branch in blossom, which, he said, was copied after Kōrin, and published a book of designs which were inspired by the Kōrin style. Shortly afterwards Sakai Hitsu began working in Rimpa style, and found an eager audience for his work. The inrō in this surimono, which is covered with Korinesque design of mandarin ducks, is signed Hōitsu. Since it was normal for a netsuke to match the design of the inrō it was meant to go with, it is reasonable to suppose that the netsuke ox is meant to indicate the zodiacal year. There was a year of the ox in 1805, and surimono in this format were common at that date, but Mr. Jack Hillier, who has recently studied the revival of the Rimpa School during this period, thinks that a Hōitsu inrō would not appear then and that a date of 1817, the next year of the ox, is more appropriate. like a jewel of spring.